A delay by the Department of Wildlife Conservation (DWC) to submit a proposal to include newly discovered endangered reptiles to the CITES list (Convention on International Trade of Endangered Species of Wild Fauna and Flora) is preventing international action against those smuggling reptile species out the country, a former Customs Deputy Director claimed. Mr. Samantha Gunasekara, the founder of the Customs’ Biodiversity Protection Unit (BPU) told the Sunday Times that he provided the DWC a Scholarly Document requesting rare engendered reptile species be added to CITES ensuring that action could be taken internationally against those smuggling these species. However, he said though he provided the document well ahead of time, the DWC provided the document to the Foreign Ministry only two days before the closing date. Therefore the proposal could not be included before the 17th Meeting of the Conference of the Parties to CITES held at Johannesburg from September 24 to October 5. A delegation from Sri Lanka too participated in the convention and proposed the inclusion of Thresher Shark in the CITES list. 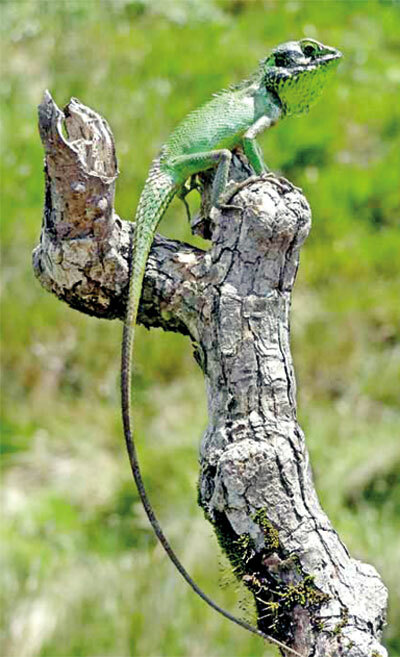 However, DWC Acting Director General W.S.K.Pathiratna said though he was unaware of any document being provided on proposing endangered Sri Lankan lizard species to be included in CITES, yet support for anyone who submits such a document would be given. However, Mr. Gunasekara said the document was submitted through the Ministry to the Department, but the officials had taken up the position that there was no necessity to submit the document. Mr. Gunasekara claimed at first a foreign scientist had provided the document to the DWC but due to lack of response it was forwarded to him. Thereafter he had informed the minister in-charge of Wildlife Conservation and appointed a committee of foreign and local scientists who were willing to send a proposal to CITES free of charge. “Meanwhile I investigated and learned that several organised groups were engaged in smuggling Sri Lankan endangered reptile species” he said. He explained that he was unable to identify individuals but was able trace how the highly organised smugglers operated their multi-billion rupee business of capturing and exporting endangered and newly found rare species avoiding international detection by exporting reptiles not included in the CITES. Mr. Gunasekara explained that many Sri Lankan gecko species, lizards and snakes are endemic and make rare exotic pets for which there is a high demand. The trade is carried out in a process where experts pinpoint where the reptiles are found and inform a separate capture team to go to the selected region of the forest. Then they provide the transport to fly the animals abroad. The CITES is an international document which covers endangered species in captivity and therefore is stronger than the Flora and Fauna Protection Ordinance which does not cover animals bred in captivity. “The CITES protected species is an animal which has to be exported with a CITES document from the DWC and when the animal is internationally recognised as an endangered specimen Interpol, Customs and foreign countries can ban or place restrictions, or take legal action against the smugglers,” he said . A businessman who was arrested during a raid by Department of Wildlife Conservation (DWC) officials for keeping 18 endangered Horned and Leaf-nosed Lizards was released on bail of Rs. 200,000 after being produced before the Negombo Additional Magistrate Kapila Dushayantha Epitawela. He pleaded guilty to four offences including removing an animal from its natural environment and keeping animals illegally. The man was fined Rs. 50,000 for each offence. The man identified as Suren Cooray (41) was arrested at Kanuwana in the Ja Ela area by the DWC flying squad on a tip-off. DWC Acting Director General W.S.K.Pathiratna said the man was engaged in the reptile smuggling racket and providing reptiles to foreign dealers. “According the Wild Life Act it is illegal to capture, exhibit or rear wild life specimens mentioned in the Protected List. Even the remains of a dead specimen cannot be kept in custody,” he said.